While the sports world was watching one Knight, the Scarlet Knights were (on that elusive NFL network) running up and down the field in the Texas Bowl. It's all so interconnected - Bob Knight, coach at Texas Tech was vying to become the all time winningest coach in NCAA Men's basketball (he didn't) while the Scarlet Knights of Rutgers were playing in the Texas Bowl, vying to complete the greatest season in the school's long (longest) football history with a win (they did). It was a fun game to watch. I gotta say, Rutgers is an excellent team and they looked very poised and ready last night; plus, their red uniforms look really good on TV. R U rah rah! 6-4. In the other two games, the ill clad golden bears of Cal stomped on the Aggies - 6-5.
and, the OSU (no, the other one) Cowboys washed away the rolling Tide with a last minute field goal - 6-6. Five games today (it's like New Year's Light) starting at 1pm- and, although it does mark the debut of the Big Ten this Bowl Season, none of the games really tempt me to cut out of work early or to tune away from Days of our Lives (what is EJ going to do????) - But Saturday hosts a few interesting match ups - Navy/BC - Longhorns/Hawkeyes (just for the carnage) - Georgia/VA Tech. One game on Sunday (Smurf Turf) and then it's New Year's Day and 12 hours of football. Please begin the chilling of the chip dip now. Yesterday was sort of a bad karma day (hopeful that today is better) - I had a really nice time with friends for a post christmas christmas, but, other than that - the day was not my favorite. As evidenced by the final score of the emerald bowl. My Phillyblog Fantasy Football team, despite a not-so-great performance in the final weekend, finished in first place - winning the regular season head-to-head and playoff! Woo hoo! Heading home for the holidays. I'll be back next week to report how I've done on bowl predictions. Also, my Fantasy Football teams are doing well - one (which finished the "regular season" in first place) is in the championship game this weekend - the other (in a points only league) is in 2nd place. Both teams' efforts will be, very likely, thwarted, single handedly, by LaDanian Tomlinson - but you still get a Yahoo! trophy for 2nd place, so I'm not too bitter. I want to clear up a few things about my Oregon prediction. This in no way suggests that I'm actually rooting for the Ducks - it's just that I (ever so slightly) like them better than the BYU Cougars. I do not have a deep set loathing for the Ducks - but they were part of the debacle of 1994- and for that they have been on my "don't root for them unless it can help PSU list" ever since. I'm breaking with that tradition this year because I just can't root for BYU - and Oregon's season has been defined by outrageous officiating - which is something we're familiar with - so I'm giving them the edge on this one. I watched a little of the game - it wasn't as competitive as some may have thought. Northern Illinois looked totally outclassed at in every aspect of the game - except for punt blocking - they do that well. It's early, but the biased bowl prediction record is 1 - 0. Next game is Thursday - Dec. 21st. TCU (10-2) vs. Northern Illinois (7-5) - Horned Frogs vs Huskies. One of many illitrative match ups. As we all know, the horned frog shoots a red colored substance from it’s eyes when attacked; that’s pretty wicked. Plus they wear purple. So, I’m going with TCU. Once again Poz has been named to an All America Football Team. Other Lions were named to the 2nd and 3rd teams (Connor, Brown, Kapinos...) - The Big Ten had a huge showing in the list. There are so many AA teams named these days. Poz was named 2nd team linebacker on SI.com - I believe that there are 4 other lists - but it's nice that the kids get recognized, regardless. Year old hat tip to EDSBS - Bowl Predictions based solely on personal bias. Last year my grudges/leanings/basically unsubstantiated hatred earned a 61% average - not too bad. This year we've got 32 Bowl games - hosting nearly half of the college football pool - making it necessary to learn some new mascots, etc. College Football on Fox? Non-BCS games after New Year’s? Are they going to make the kids play on a soccer pitch in Toronto? Troy (7-5) v. Rice (7-5) Trojans vs Owls. Troy - they like to slip-n-slide together - not too cool. At Rice they have a pithy little Owl cartoon that disses upcoming opponents. Let's go Owls! Rice. South Florida (8-4) vs. East Carolina (7-5) - Bulls vs Pirates. Pizza on the internet - that makes me think of football. Pirates are very "in" this year - but I can't muster the energy to root for Easy U - so I'll say South Florida. New Mexico (6-6) vs. San Jose State (8-4) Lobos vs Spartans - How unfair is this? New Mexico in the New Mexico Bowl. And how sad will it be if they lose? And I think they will lose - a friend of mine used to live near San Jose- so that's good enough to me. Tulsa (8-4) vs. Utah (7-5) - Golden Hurricane vs Utes. We don’t ask for experience; we give it. You can’t read it in a book; you live it! I gotta say, not a big fan of the mental image that a “golden hurricane” congers - but in support of our troops, I’m going to go with Tulsa. Arizona State (7-5) vs. Hawaii (10-3) - The rainbow warriors now just call themselves the Warriors (bor-ring) - Warriors vs Sun Devils - With all of these sprirtual images in play, at the very least they’re gonna make it rain, or volcanos errupt - or something. I’m thinking that Hawaii will be best suited to weather the elements. With that and home team advantage, I'm picking: Hawaii. Central Michigan (9-4) vs. Middle Tennessee State (7-5) - Chippewa vs Blue Raiders. Middle Tennesse State? who? whaa? Central Michigan had a pretty good season - I see them winning over the MTS Raiders. C Mich.
Cal (9-3) vs. Texas A&M (9-3) - Golden Bears and the Aggies. Cal was way overrated at the beginning of the season - the Aggies pulled off an improbable upset late in the season. Oh this is another horrible choice. but - Aggies? Missouri (8-4) vs. Oregon State (9-4) - Tigers vs Beavers. More Tigers? I gotta say, I'm very disappointed with the match ups for Oregon State and South Carolina this year - they could have been much more entertaining - they could have played each other (snicker) - Regardless, OSU is up against Mizzou this year - OSU beat USC (the other one) - which was huge - but Missouri had a fine season. Any Bias against the pac ten is easily negated by anti big 12 sentiment. hmmm - eenie meenie - Mizzou! South Carolina (7-5) vs. Houston (10-3) Gamecocks vs Cougars. Again with this Houston team - and again with Coach Spurrier (hate him) - but, I have to thank SOS for not changing jobs and going to another team this year - I'd hate to see a team that I dislike, get a decent coach, and I'd really hate to see a team that I somewhat like get him as coach - since I don't give a rat's backside about USC - I'm going to say "thank you" to Coach Spurrier and say that the Gamecocks are gonna win (just watch for the blocked kicks). South Carolina. Minnesota (6-6) vs. Texas Tech (7-5) - Golden Gophers vs Red Raiders. It ain’t gonna happen, but I’ll go with Minne. Maryland (8-4) vs. Purdue (8-5) - Turtles and Boilermakers. Go Home Maryland, Go Home! I have no reason other than conference loyalty and the "we beat them" factor - but I say Purr - Do! Virginia Tech (10-2) vs. Georgia (8-4) - Hokies vs Bulldogs. Georgia had 2 unbelievable losses this season - and I have a long lived distain for the Hokies - this is a really tough one. VA Tech. Auburn (10-2) vs. Nebraska (9-4) - Tigers v Cornhuskers. Both teams have had, for them, disappointing seasons. Many folks listed Auburn as their National Championship team, but the Tigers failed to produce. I say they rebound in the bowl game. Auburn. Wisconsin (11-1) vs. Arkansas (10-3) - Badgers vs Razorbacks. Should go with conference loyalty, but wisky broke our coach this year. And Houston Nutt is one of the all time greatest names in football, ever. I hate the idea of pulling for an SEC team, again (and again) - but I'm going with Arkansas - I hope they kick out of bounds 14x in a row. Arkansas. Wake Forest (11-2) vs. Louisville (11-1) - Demon Deacons vs Cardinals - Again with the spiritual symbolism. Wake isn't being given much of a chance in this one - for that reason, I'd like to see 'em win. WF. Cincinnati (7-5) vs. Western Michigan (8-4) Bearcats - Broncos. Toronto, eh? On Epiphany no less - those wacky canadians - My understanding is that they will be playing the game on an American football sized field - but there will be beer tents. Cinci is losing their coach - I know little to nothing about the broncos of western Michigan - I'll go for the city team rather than the directional team - Cincinnati. Southern Miss (8-5) vs. Ohio (9-4) Golden Eagles v Cougars. Really nothing to say about this one, except I'm going to extend my dislike for the land mass west of PA and go for So Miss. Ohio State (12-0) vs. Florida (12-1) - buckeyes and Gators. This is the big one - the National Championship. The BCS is taking a lot of heat for this pairing - and as a big fan of all things anti-BCS, I'm almost tempted to root against the gators. But my heart is with the underdog - but are they really the underdog - UF won the basketball national championship last March (i was totally rooting for them then - Yea Noah!) - they don't deserve another championship (they'll never shut up about that) - but tosu won the NC in 2002 - that's too soon and they're just so slimy - and I really don't want Evil Sweatervest McCheatypants to win - he's just not that good (they'll never shut up about that) - So it's a horribly difficult choice, based mostly on not-nice vibes - but my pick is Florida - now go out and disappoint me, guys, I know you can. Team Captain, Paul Posluszny, was named team MVP at the Nittany Lions' annual football banquet. Joe's first press conference since his surgery. Paul Posluszny was awarded his 2nd Bednarik Award, as the nation's top defensive player. ESPN.com has a poll regarding the BCS results - I participated - and below is a snip of the answers (my choices were the #1 answers on each of these questions) - I find the result of #8 to be rather impressive (and #7 rather interesting)- are you listening College Football? There were about 150,000 "votes" at the time I took the poll. 6) Which is the best team not playing in a BCS bowl? 7) Which is the worst team playing in the BCS? 8) Does college football need a playoff system? EDSBS - Archive - BOOM. or that I'm "happy" about results of the BCS rankings - but I will say, that, a month ago, when no one gave Florida a chance - i did. As evidenced by my comment on this thread on Every Day Should Be Saturday (click on link above). Gonna steal EDSBS's idea again (with totally biased Bowl Predictions) - coming soon. Matt Kizner. Matt Kizner; he was so cute - bad quarterback, but so cute. Not complaining - just happy to see that someone thinks we'll win a game this year. who's number 1? Who's Number 1?!?! Mr. Posluszny, that's who. Levi is number 6. Jay so needs to wear a v-neck/open collar shirt. With the rest of the running backs nursing injuries - here's to Tony staying heathy! Press Release - 9: "AIG Nittany Lion Hotline Has 2006-07 Debut on Thursday"
Well, Texas' offense worked for us last year - maybe the mountaineer defense isn't such a bad idea - but, then again, it wasn't the wvu defense that was impressive last january - we'll see. The 1986 team is probably one of my clearest Penn State memories - I loved those guys - 30 team members will be there - I wonder if Duffy will? he looks a little like the "missing Savage brother"
What on earth are Deon and Terrell talking about? DW looks very serious and Jordan looks confused. Younger brother of Franco, who had a standout year in his position as Safety in 1978, on the team that would take the Lions to the Sugar Bowl to play for the National Championship. The quotes are from Joe's preseason press conference. He cares about the game and he cares about the kids. This is not professional football and anyone or any scheme that is focused more on money than on student athletes should be removed from the game. Can you talk about the rule changes this year and your thoughts on them? I don’t like the rule changes, but you have to live with them. Obviously, it is a challenge to the coaches. We have already talked a great deal about it and we have to set up practices so that we put ourselves in different situations that will be affected by the rule changes. They are doing it because of television and that doesn’t light me up. I think that we (should) cut out a couple of commercials and never mind cutting out the way the game is played. It is going to have an awful lot of bearing on the end of the game and wondering if you are going to kick off whether you are going to take a safety or those kinds of things. I think we have to think that through and put ourselves in those kinds of situations as to what we are going to do. I was on a rules committee for a long time and, unfortunately, there are not enough people who are coaching on those committees. If you look at the rules committees, see how many Division I football coaches there are…maybe one or two and they are the ones that make the rule changes. I am not happy, but if that is the way it is, that is the way we will play with it. With the 12-game schedule and not having a bye week, how does that affect the pace of practices and what are your feelings not having a bye week? As I tried to get across to the people at the Big Ten meetings back in May, we have gone from playing an 11-game schedule with one week off to playing a 12-game schedule with no weeks. I think it is going to make it difficult. You are going to have to watch to see how much they have to do and tie it in with what is going on in the classroom, final exams and mid-term exams. I really take exception to what the NCAA Commissioner said, Myles Brand, “No difference a week off than a week when there is school.” He doesn’t know what he is talking about. When we had a week off, you could always kind of gear in some things and make sure your kids got a little rest and take a couple of days off so they can get caught up with term papers and do different things. We don’t have that now. If you go 12 games for 12 weeks in a row, that is not going to be easy. I would prefer, obviously, that we had an open date. I would prefer we play in 10 games as long as you get this BCS and everything going on. I think 12 games is tough, tough, tough for kids, but it is (about) money. For full transcript goto GoPSUsports.com. Oh, there's a nasty joke in there somewhere. What the? Mark Rubin is either the most unlucky guy or the most fragile. Amazing, another pre-season injury - this one, however, does not appear to be a season ender. That I'm never happy. When sports writers say nice things about PSU (particularly in the preseason) I get agitated about the jinx factor. But, the reality is, I'd rather them down play PSU's chances than build them - Hopefully our "big" opponents will be looking past their PSU match ups. It won't be very long before we know - PSU's biggest games are in the beginning of the season (or at least "on paper biggest"). 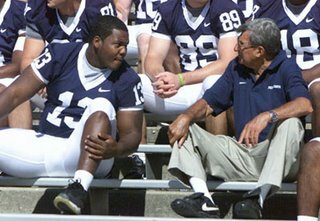 ESPN.com - NCF - Another decade for JoePa? When asked for comment (in my imaginary press conference), Mr. Posluszny remarked "while it is a great honor to be recognized, it's the play on the field that really matters. But yeah, Troy Smith is offensive." 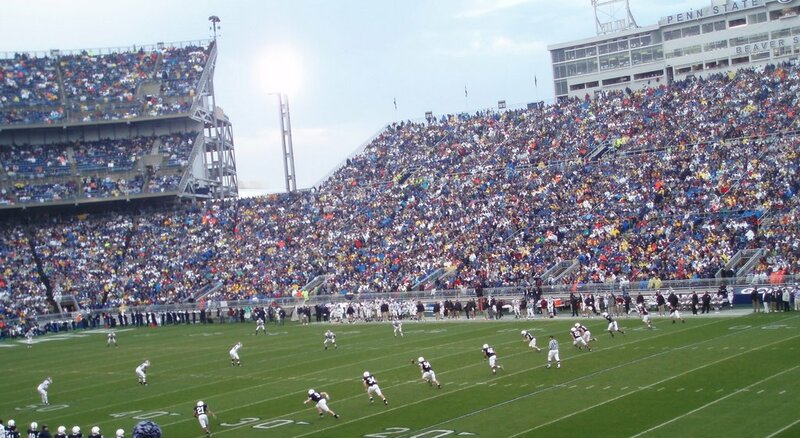 GoPSUsports.com Penn State Finishes 15th In Directors' Cup Standings: "Penn State Finishes 15th In Directors' Cup Standings"
Just a reminder: If would like to see the games that we are tailgating, single game alumni tickets are going on sale at 1000 hrs June 30. 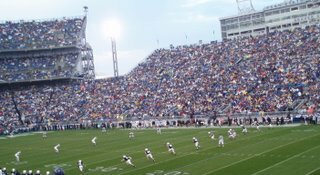 You can only get tickets thru http://www.GoPSUsports.com There is a limit of two tickets for the Saturday, Oct. 21 Homecoming battle with Illinois. Tickets are selling out fast, so be sure to get them now. I also have 2 tickets to sit with Johnny (AKA Chris F) and I in section WCU for $50 each. Let me know if you'd like to sit with us. I also still have hotel rooms for the games we are tailgating. The sooner you let me know, the more likely we'll still have space. 12 kids on the Dean's List - for those who don't remember - PSU's dean's list is 3.5 - not rolling like many other schools. the fellas at EDSBS linked to a guy (a Georgia Tech guy, mind you) who is ranking the college football conferences by strength of Mascots. An admirable concept, but I feel that much of his analysis falls off the mark. And, for as biased as I am regarding the furry fellows who follow the football faithful, I got all annoyed with the as yet to be written critique of the Nittany Lion (just assumption, based on the dude's write-ups of the ACC mascots - how on earth can anyone from the ACC have any respect for FSU? how?). But it's okay to disagree; if it weren't for dissent we would all still be having kippers for breakfast. PSU had gone undefeated in 1985 but came up short against Oklahoma in the Orange Bowl championship game. In 1986 PSU repeated the undefeated regular season but entered the 1987 Fiesta Bowl as huge underdogs against the #1 Miami Hurricanes. No one, especially not Heisman Trophy winner, Vinny Testaverde (are you seeing a trend here? ), or coach Jimmy Johnson gave Penn State a snowball's chance in Tempe. But the Lions kept their cool, both on and off the field and defeated UM 14 - 10. Testeverde threw 5 interceptions and the Lions defense forced 2 fumbles. John Shaffer and DJ Dozier scored for PSU. Late in the 4th quarter, Miami pieced together a drive down to the Lions' 5 yard line. The Hurricane defense had been tearing up the field, but Johnson chose to throw. Testaverde was sacked and then they had to put it up. With time ticking away, Vinny threw the ball into a sea of white jerseys. Pete Giftopoulos stepped in front of the ball, sealing the Lions' victory. The Lions had slayed the giant and won their 2nd National Championship. I've been compiling some prose for the website - so I thought I'd post it here as well. 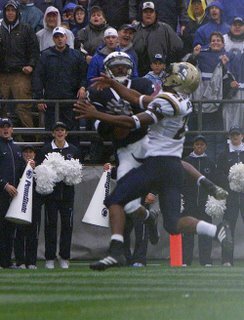 Right now I'm working on the "football" section of the site - with recaps from memorable games and seasons. PSU’s first National Championship followed the 1982 season. The Lions had played for the National Championship in January 1979, but fell short against Alabama and the Bear. In 1981 PSU had spent time ranked #1 but finished the season with 2 losses (Miami, and yes, Alabama). 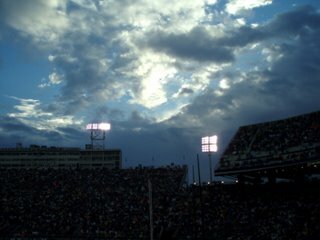 In 1982 PSU had big hopes but once again lost to Bama; I remember, I was at a friend’s birthday party; when we returned from the roller skating rink, her dad had the game on TV - I couldn’t believe that PSU had lost, and I knew that my Dad would be devastated. I got to go to one game that season - the slaughtering of NC State - it was a good afternoon. With 1 loss, the Lions climbed back up in the rankings and finished the regular season ranked #2. They met the #1 Georgia Bulldogs, coached by Vince Dooley and featuring Heisman Trophy winner Hershel Walker, in the 1983 Sugar Bowl. The Bulldogs were the odds on favorite to win the National Title. Led by Todd Blackledge, Curt Warner, Kenny Jackson, Harry Hamilton, Mark Robinson, Scott Radisec, Greg Garrity and many others, the Lions played with tons of heart and determination and won the game 27 - 23. Garrity scored the "stay ahead" touchdown with a now immortal layout leap into the endzone. 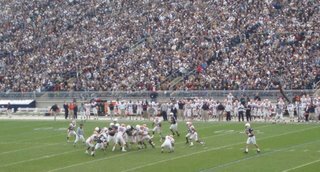 Penn State had won the ball game; Penn State was the National Champion. Soon after the game, we went outside - it was cold and clear and you could hear cheering and horns honking all around. After all those years of winning and yet waiting, Penn State had won the Championship, ironically, with a non-undefeated team! They had a parade in State College a week or so later. It was snowing like crazy but Dad and I went downtown, all bundled up to cheer the victors. I'm the first person to applaud when PSU players are recognized nationally - but all this pre-season stuff makes me nervous. PSU has some very gifted/talented kids returning to the squad this year - but it really means nothing if they can't make it work on the field. 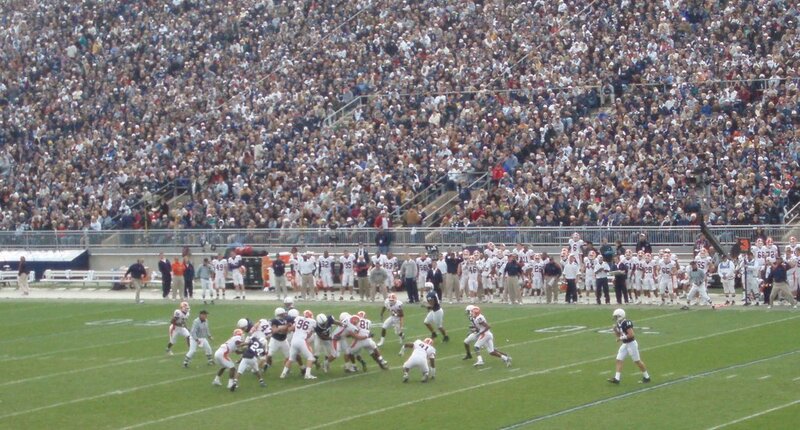 The 2006 season is tough - and it's tough early and it's tough away from University Park. The Lions and their new starting quarterback are going to have to show a lot of fortitude early, and on the road. I'm thrilled that the kids are getting some recognition - but many of the kids they'll be seeing across the field are as well. Baby steps Arnie, baby steps. You want the Eagles? GoPSUsports.com Interestingly, none of them are the kids who were drafted this past weekend. Defensive tackle Scott Paxson and tight end Isaac Smolko have signed with the Super Bowl Champion Pittsburgh Steelers. Cornerback Anwar Phillips has signed with the New Orleans Saints. I hope that Scotty can turn things around. 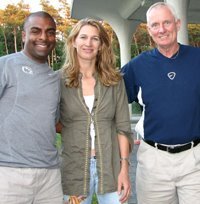 I think he's a very talented football player - I wish him luck - as I do all of the Penn Staters! but it's really special too - and somewhat the genesis of all we now do. The phrase "To the Lion" is what my dad (and his cronies) used to say after every PSU score - they'd raise their respective glass(es) and toast the team. It was the most consistent and personal PSUism that I could remember my father uttering. When Pop passed away, suddenly, in 1999, my mother and I found ourselves confronted with many decisions and choices to make in a very short time. One such choice was if we wanted any special message on his grave marker (I warned you this was morbid) - my mom looked at me and asked "Fight on State?" - I half smiled and said "To the Lion".